Saguaro National Park BioBlitz Oct 21-22 October 21, 2011 Scientist/Team Leader: William R Miller Scientist Primary Taxa: Tardigrada Inventory Location:Picnic Area Sus, Gully North of Sus Picnic Area Geotag: Provided by scientist 32.27121, -111.20743 Field_Datasheet_ID: 1750 Datasheet_Record_Number: 1 Scientific_Name: Milnesium tardigradum Image obtained by scanning photo provided by scientist ITIS taxonomy tags: taxonomy:Kingdom=Animalia taxonomy:Phylum=Tardigrada taxonomy:Class=Eutardigrada taxonomy:Order=Apochela taxonomy:Family=Milnesiidae taxonomy:Genus=Milnesium "taxonomy:Species=Milnesium tardigradum"
Boil ’em, mash ’em, stick ’em in a stew. They’re versatile! No, I’m not talking about taters. 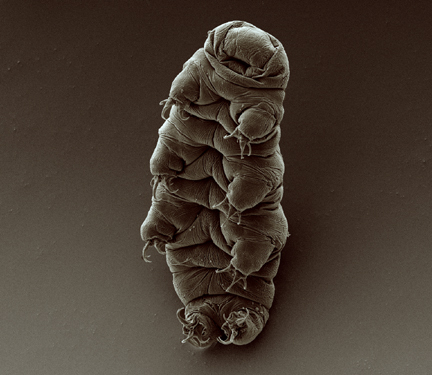 I’m talking about tardigrades: quite possibly the most durable creatures on Earth. They might also be the strangest combination of cute and terrifying anybody has ever seen looking through a microscope. 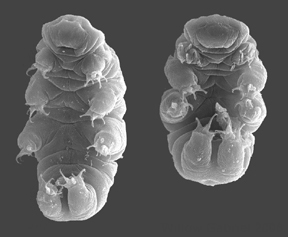 Tardigrades, also known as water bears, evolved 500 million years ago. They have survived on a diet of moss and lichen since around the time the first fish evolved and shortly after animals evolved at all. 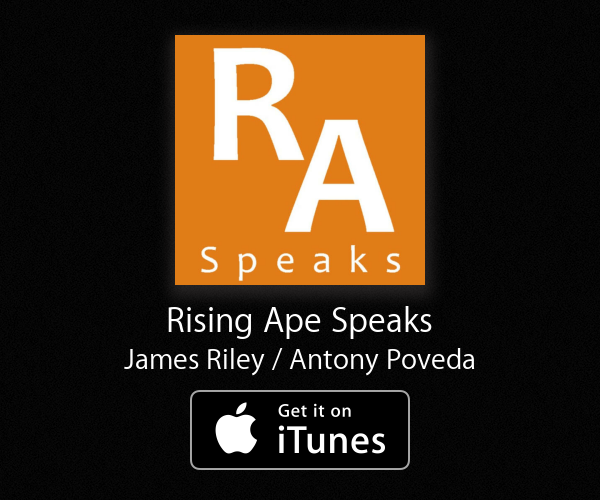 While their basic body plan hasn’t changed much, they haven’t been evolutionarily idle. They’ve developed some pretty neat adaptations (some of which will be discussed below) and diversified into over 1000 unique species. One thing all of these species has in common is size: all species of tardigrade measure between 0.1-1 millimetre (comparable to the size of a single salt crystal). The amazing thing about these itty-bitty balls of chitinous cuticle is that they can withstand pretty much every type of extreme we can cook up. They’ve been boiled to over 150 degrees celsius without breaking a sweat. They’ve been frozen to -250C and didn’t need tiny parkas. They’ve been dipped in acid, shot into space, dried out, and zapped with thousands of times the lethal radiation dose for a human and they just kept chugging. Why are we being so cruel to these tiny creatures? Because they keep surviving. Things that terrify us and would kill almost any lifeform barely even faze them. Tardigrades have expanded the notion of habitable environments and understanding their indestructibility has profound implications for both earthbound medicine and for life on other worlds. I think tardigrades are pretty darn cool. This is likely due in no small part to the fact that the lab where I did my thesis in undergrad was home to a healthy colony of moss-eating tardigrades. Up on the third floor of the Life Science Building at McMaster University, my former supervisor, Dr. Stone (or Doc Roc as he likes to be called) has been testing tardigrade tolerances with Taru, his PhD student. 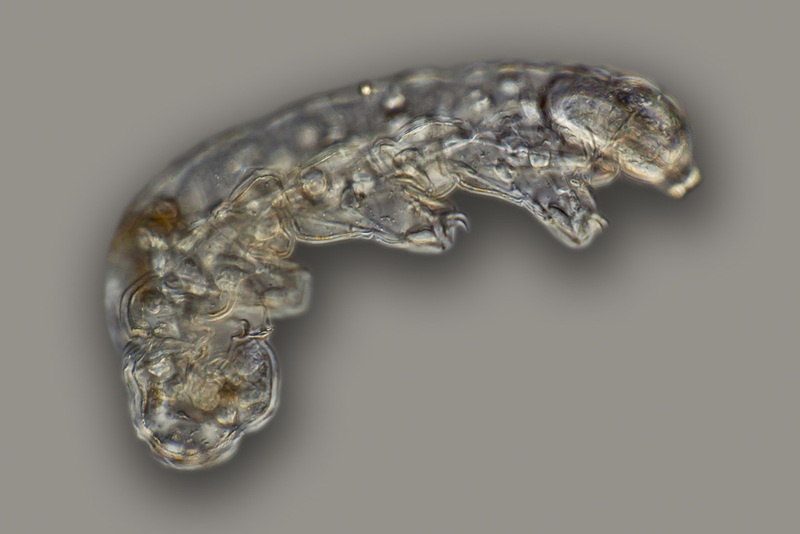 “Ewww, you can see all of its insidey bits” – Me, the first time I looked at a tardigrade through a microscope. Image by Daniel Adrian Ciobanu, Krzysztof Zawierucha, Ioan Moglan, and Łukasz Kaczmarek. I got in touch with Doc Roc this week to ask him a few questions about tardigrades. To give you an idea of the kind of (awesome) professor he is, one of his research goals was to publish a one-sentence paper. He accomplished that goal with the help of quite a number of semi-colons. As you’ll see below, I think he likes that useful but oft-forgotten punctuation mark. Thoughtful Pharaoh (TP): Where do you find tardigrades? Doc Roc (DR): Tardigrades are found the world over, literally on all continents and in all bodies of water; they inhabit all systems, marine, freshwater, terrestrial; they occur terrestrially on moss. TP: What have you done to test the limits of tardigrades? DR: We have tested their tolerance to temperature (cold), radiation, desiccation, pH, g-forces (simulated), and red food dye (I think that you know the tale); we have witnessed complete revival from -80 degrees Celsius for up to 6 months (but they can tolerate -250 K); 4000 Gy radiation (6 Gy kills humans); completely drying out inside an evaporating water droplet (tales in the literature purport over 100 years in a desiccated state); over 16000 g (Earth atmosphere being 1 g – meteoritic impact being an order-of-magnitude greater, however); and sensitivity to red food dye. TP: What is the most interesting thing about tardigrades, in your opinion? DR: I think that understanding how their tolerance and reproductive modes (e.g., parthenogenesis) evolved are the most interesting topics for tardigrade research. TP: What do you want to do next? DR: We plan to investigate how they tolerate the high radiation doses (e.g., their DNA repair mechanisms). TP: Do you ever name the tardigrades? TP: If they’re so invincible, why haven’t tardigrades taken over the world? DR: Organisms are limited in their resources, so populations can grow unchecked only to the extent that living materials are available (populations crash thereafter); predators additionally can reduce population sizes. TP: What can studying tardigrades tell us about life on other planets? DR: Studying tardigrades can inform us about the limits to which organisms can survive, helping researchers to identify which extreme environments are viable and whether organisms could be transported between planets. If you have any other tardigrade questions, feel free to comment below and be sure to share this with your friends. Spread the water bear word and let us not be frightened of our tardigrade overlords! This guy looks like he’s ready to partygrade. Image by the Goldstein lab. A (bearded!?) Hank Green produced a video about them for SciShow in 2012.